So here's something to think about the next time you find yourself ready to quit on a long run. In 1994, a 22-year-old college senior was on vacation with his girlfriend in Hawaii when he broke his C4 vertebrae after diving into a swimming pool. The accident left him paralyzed from the neck down and doctors told him they didn't think he'd ever walk again. As the young body builder and exercise science major began to have an awareness of what that would mean he also started to have an awareness of the bottom of his foot. The guy walked out of that hospital, and on April 2, 2016, he finished his seventh Ironman 70.3 race in Oceanside, California, where he swam 1.2 miles, biked 56 miles, and ran 13.1 miles. 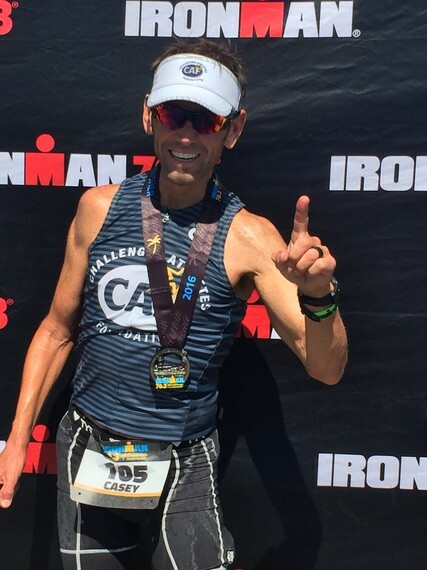 "I had a good swim and a good bike but the run was tough," Ironman Casey Kammel, 44, deadpanned in a telephone conversation with me a few days after the race. Kammel wears a brace on his right leg when he runs. He has a limp, and he worries about catching his foot in a crack in the pavement and falling, which he says happens a lot. For the swim, Kammel's devised a way to strap his right hand, which is closed like a fist, into a paddle so he can get some propulsion because the accident left him with limited strength and range of motion in his right arm. He says he's fine on the bike because he can wrap his hand around the handle bar. "I finished and that's always a good thing." A good thing for Kammel and for other challenged athletes seeking to find ways to pursue physical fitness. About 500,000 people suffer spinal cord injuries every year, according to the World Health Organization, and while 21 million individuals overall are living with a physical disability in the United States, very few exercise daily despite the well-documented benefits of exercise for everyone, with or without a disability. I reached out to Kammel after I came across his story because I was looking for inspiration. My only triathlon experience was DNF, and I'm currently training for triathlons in June and September 2016 but dealing with a million little injuries. I wanted to know how he does it. Kammel was always competitive so there's that, and quitting was never an option for him. "Playing baseball or football, no matter what it was, I hated losing," he told me. His father was a catcher with the San Diego Padres but whether he was born with a competitive mindset or simply raised with one, there wasn't anybody tougher on Kammel than himself. "Deep down I've always had a desire to win." But not at endurance sports. He was never interested in swimming or running or cycling and he never got struck with marathon fever. As a weight lifter and body builder he rarely did cardio exercise except for maybe sprints when he had to as a football or baseball player. After the accident, Kammel wore a halo brace, which attaches to the head and stabilizes the cervical spine, for three months. His rehab focused on functionality not fitness. He had to re-learn how to stand, how to walk, how to get in and out of a chair or car. It took him 45 minutes to put on one sock and a pair of gym shorts the first time he tried to dress himself. He had to re-learn how to write, how to eat, brush his teeth. Where his focus was on competitive body building before the accident, when he weighed 185, he was now, at 135, spending his days mastering activities for daily living. A few years had passed and Kammel was watching on television an Ironman race featuring Team Hoyt -- the father and son team from outside Boston where the father uses a rope to pull his son, who has Cerebral Palsy, in a boat during the swim, a special seat on the front of his tandem bike for the cycling section, and a specially designed wheelchair for the run. "I saw the father do this in an Ironman and watching them touched me," Kammel said. "I was inspired by that father and thought if I could do an Ironman it would be a big accomplishment for me and maybe testimony for other challenged athletes, or anyone, that if you really want to achieve something, you can." Kammel decided to compete in his first Ironman triathlon in 1999. It took him too long to finish the swim so he was unable to complete the bike or the run. Kammel's never really regained his interest in lifting weights -- part of that is because he says his body is lopsided -- and body building also doesn't have any appeal. By 2000, Kammel was 100 percent focused on endurance training. He said he doesn't experience any kind of endorphin rush but he does get a huge sense of accomplishment and achievement after a big race or workout. While a lot of the training comes naturally to Kammel -- he's got a degree in exercise physiology so he takes a top-notch approach to his nutrition and understands the vast array of training methods -- he's always dealing with a neurological deficit. "From the spinal cord injury, I have muscles that go into spasms," Kammel said. For example, his muscles will get into tune being on the bike but then getting off and switching to running can be difficult. "Able-bodied people can get off their bikes and start running and just use different muscles." For his brick workouts, Kammel will do a 60-mile bike ride and then run for 8 miles. He'll slip an orthotic into his right running shoe, and for the first mile he'll walk for one minute and run for one minute in order to help break up the spasticity and get into his stride. Overall Kammel shoots for a 12-minute mile -- he'll run for 11 minutes and walk 1 minute. Generally he runs 15 miles per week. During the Ironman races, the aid stations for the runs are one mile apart. "That way I can run for 11 minutes, get to an aid station and walk through as I hydrate," Kammel said. His long bike rides are between 70 and 80 miles with elevations between 5,000 and 7,000 feet. Cycling is Kammel's favorite race event, and he gets a mental lift when he approaches a hill during a race and able-bodied cyclists are walking their bikes. "It's a huge boost for my mental game to see people walking their bikes," he said. Maybe they haven't trained hard enough or maybe they just don't want it badly enough. Because Kammel does and the biggest mental game is the one he plays against himself, he said. He knows how fortunate he is that his spinal cord injury wasn't worse. "I use every bit of mental focus to see how far I can push myself physically." He says he pushed himself to the limit during his rehab, and pushing himself during his endurance training is now a habit. He said he'd be afraid that if he gives up just one bike ride or one swim or one run, that'd be it for him. Professionally Kammel is a personal trainer and coach and the vice president and chief financial officer of Executive Fitness Private Training Studio and Executive Fitness Corporate Wellness in Long Beach, California. But he's also committed to racing to support the Challenged Athletes Foundation where he competes with men and women a million times worse off than he is, he said. "They've lost limbs, they've got head injuries, they've lost their sight," Kammel said. "What these people have endured -- I don't have a thing to complain about."